Thunderstorms on July 21 that unleashed torrents of rain and spawned three tornadoes in southern Maine also made their mark, happily minor, on the Hedge/Roger Williams construction site. Winds, which gusted up to 90 mph in some parts of the state, knocked over 40 feet of the fence around the site. “We called the contractor,” Portland-based Wright-Ryan, “and the superintendent was nearby, and he just came over and put it back,” says project manager Paul Farnsworth. In non-cataclysmic construction news, the first phase of creating a steel framework within Hedge Hall is all but complete. Steelworkers have a few more pieces of steel to put in, and then it’s just a matter of squaring things up and tightening the bolts, says Farnsworth. 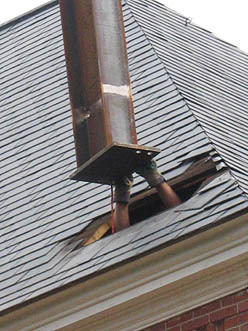 This steel is supporting the structure up to the roof. The next batch of steel for Hedge will support the roof itself, but that won’t happen for a while. In fact, the next steel shipment, due during the second week of August, is bound for Roger Williams Hall. 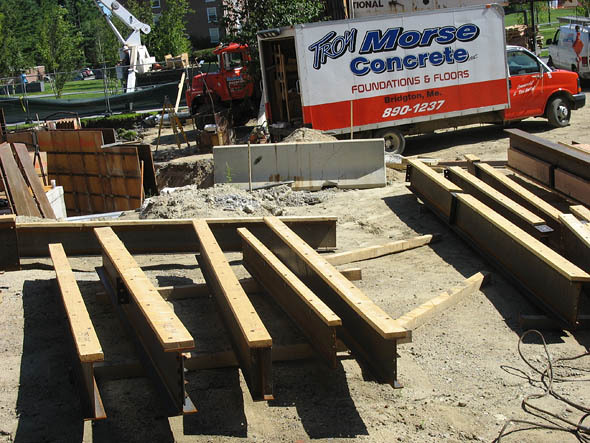 Also at Hedge, work continues on the foundation for the addition that will face Alumni Walk. Inside the building, workers will drill the hole for the hydraulic piston that will lift and lower the elevator. This requires dangling a chain down inside the new elevator shaft to bear the weight of a big hydraulic drill that will bore the 14-inch-diameter, 39-foot-deep hole. 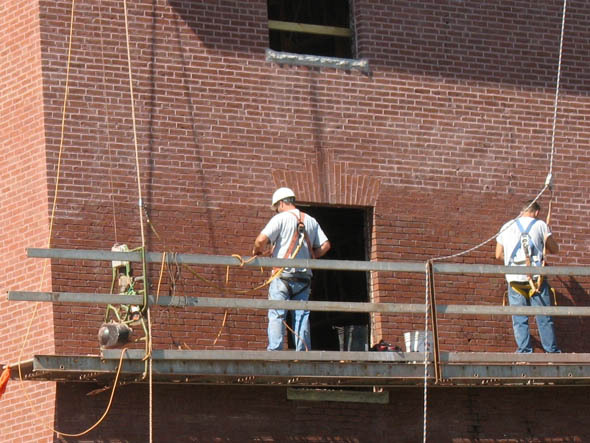 Over at Roger Williams, masons are reaching the end of the brick work — cleaning and repointing — that has brightened up the building’s facade. (Staring at the spiffed-up walls one morning, Campus Construction Update was pleased to notice, for the first time, decorative courses of Greek key and rope masonry that hadn’t previously been so apparent.) The north and final wall will likely be done by the end of next week. Speaking of bricks, if you pass the Bill on the east side, by New Commons and Alumni Gym, look closely at the wall. 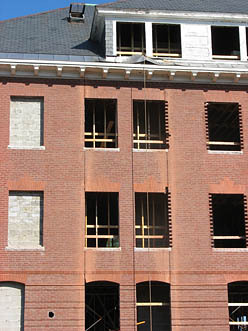 Toward the left, near where the windows have been filled in, look for two slits that have been cut from ground level to the roof. Once the interior has been shored up, Farnsworth says, that section of wall will be taken right out. Similar to what happened at Hedge, the opening will provide access to an addition. Farnsworth adds that the folks who build with concrete blocks on this project are all but done. Their last bit of work is on the elevator shaft, which needs just a few more courses of blocks under the roof. Progress is progressing on the old foundation of Roger Williams. On the inside, the last of the “one-sided walls” — actually a new layer of concrete applied to reinforce an existing wall — was poured this week. Outside, the next couple of weeks will see the end of the dampproofing, drainage work and concrete spraying that will prepare the foundation for the next 50 or 100 years. Notes from Underground: At Roger Bill, watch for the removal in early August of asphalt pavers on the New Commons plaza near the 1910 Gate. Workers will be excavating for a drainage line that will link to a vault in front of Alumni Gym. Just behind the fence next to Alumni Walk, a long stretch of new steam line is being welded up. It replaces a line that was in the way of the Hedge addition. The pipe links to a new steam vault at the east end of Hedge. Also in the world of campus steam, installation of the replacement line between Hedge and Ladd Library should start next week. The pit across the service road will be large, Farnsworth says, to accommodate water and telecom conduits too. The road is closed to vehicle and pedestrian traffic until Aug. 20. Take Alumni Walk or the stairs under Ladd if you need to cross campus east or west, Farnsworth advises. Two old abandoned steam lines at Roger Williams, in the meantime, are coming out, a process necessitating asbestos abatement. And the campus’ very oldest steam line, in case you were wondering, has also been consigned to fond memory. Scheduled for September completion, workers are replacing this pipe that connects Lane and Pettigrew halls — hence the recent commotion near Lake Andrews. Read this week’s news about the Garcelon Field renovation.